Do you want your very own personalised carrier bags at a fantastic bargain price? Well you've come to the right place! 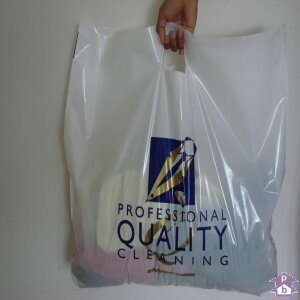 Get a quote on personalised carrier bags in less than 60 seconds with our instant quote wizard. It's so simple to use. No mess, no fuss, no waiting around for someone to get in touch with you - just enter a few details about the carrier bags you want and we'll give you a quote there and then! We've streamlined our service to make things faster and cheaper for you. No headaches over choosing from too many options - we've trimmed the order process down to what our customers need. 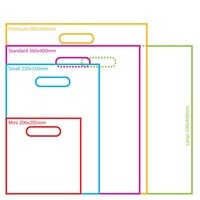 Just choose from five standard sizes of patch handle carrier bags - the classic carrier with a reinforced handle for a stronger, more substantial bag - and choose from white, clear or coloured polythene. 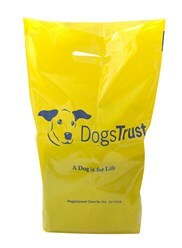 Tell us how many colours you want to print in and whether you want to print on both sides of the bag (at no extra cost!) and that's it. We cater for high or low-volume print runs and our minimum order of 1,000 bags is ideal for use at trade shows or conferences. All our bags are made from high quality polythene (55 microns thick) which gives your bag more gloss, a more silky appearance and a more substantial feel. 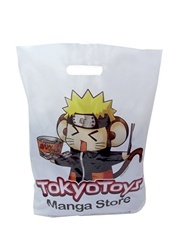 So order your carrier bags from us today and we guarantee you'll look the part and stand out from the crowd! 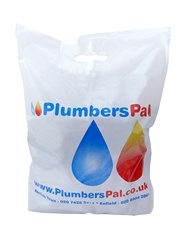 Carrier Bags is a specialist website from Polybags Ltd, the UK's number one manufacturer of polythene products. All orders placed with Carrier Bags are fulfilled by Polybags, which means direct sales straight from the manufacturer, wholesale prices and first class customer service. If time is of the essence, our huge range of stock means you can choose from a fantastic selection of carrier bags available off-the-shelf. 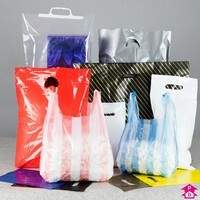 We offer a massive variety of clear or coloured carrier bags, available in plain or printed designs at discount prices. 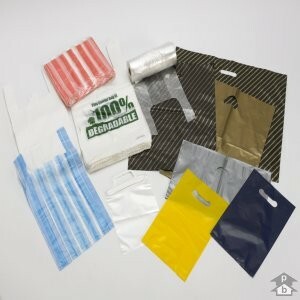 Whatever type of carrier bag you need - Carrier Bags is the place for you! 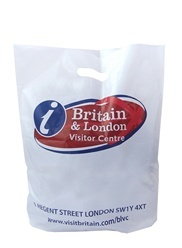 Printed carrier bags provide the perfect way for retailers to advertise their business. With a smart, eye-catching company design or logo printed on to a thick, smooth and smart patch handle carrier bag, you not only make an instant good impression with the customer but that very same customer then becomes a walking advert for your business. They take your carrier bag out of your store and into the immediate surroundings, displaying it amongst other consumers in the local area. If your bag stands out from the crowd with a snazzy logo or design, or it features a catchy advertising slogan, then other shoppers are likely to take notice, which will increase the chances of them paying a visit to your store. The other obvious benefit of printed carrier bags is when the customer gets home and the carrier bag has served its immediate purpose. With the carrier bag tax enforced across the whole of the UK, people are more keen than ever to re-use existing carrier bags for trips to the supermarket, for example. Whilst dull or, more importantly, weak and flimsy carrier bags could easily be disposed of, a strong and smart carrier bag is likely to be stored away for further use on shopping trips. What's more, when the customer retrieves your printed carrier bag they get a positive reminder of your brand and their shopping experience with you, plus any further use of the bag means it advertises your business with even more consumers. It's a win-win! All of our printed carrier bags are patch handle carriers made from 55 micron (220 gauge) polythene, to provide a strong carrier bag with a smooth and silky finish. But carrier bags come in many shapes and sizes and from polythene of varying thicknesses - or biodegradable alternatives - to suit any job or budget. The most recognisable type of carrier bag is the standard economy vest carrier, used by consumers in their millions in supermarkets and grocery stores worldwide. The economy vest carrier is made from high density polyethylene (HDPE) which provides excellent strength even when produced in very thin form, allowing bags made from HDPE to be manufactured and sold at budget prices. This traditional 'crinkly' carrier is itself available from Polybags in a variety of forms, from a cheap and cheerful 'ultra-thin' carrier weighing in at just 8 microns thick to the supreme high tensile white vest which combines higher quality bag strength with budget prices. You can buy economy vest carriers in either white, blue or classic candy stripe colours. They are also available made from 100% recycled polythene or, in the case of the EcoVest, made from 100% degradable material. Polybags stocks every type of carrier bag from the economy vest carrier, perfect for those shopping on a budget, to a range of fashion and premium carriers catering for the more luxury end of the carrier bag market. These luxury carriers include a pair of very smart carrier bags with a difference: the clip close carrier - a strong and thick carrier bag complete with an integral plastic clip and handle - and the grip seal carrier, which features a squeeze-to-seal grip seal closure at the top of the bag. Polybags also stocks a range of biodegradable and starch-based carrier bags, which can be disposed of in standard composting conditions to help do your bit for environment while getting the job done. Whatever carrier you need, we've got it covered! 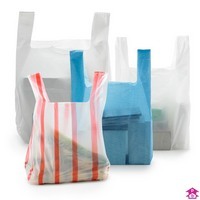 All of these bags and more are available off-the-shelf at Polybags at fantastic discount prices so, whatever your budget and whatever type of bag you are looking for, visit Polybags.co.uk for all your stock carrier bag needs. 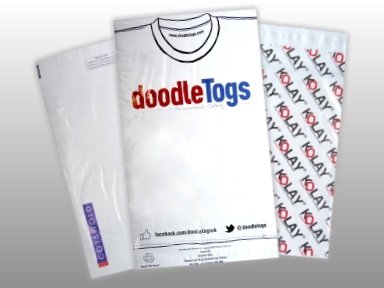 Of course, if you're looking for printed carrier bags personalised with your company logo or design, then we've got everything you need here at Carrier Bags! Visit our Instant Quote form and we can provide you with a no-obligation online quote in less than 60 seconds. No waiting for an email or a call back - we'll give you a quote that instant, 24 hours a day, seven days a week!